The second-biggest city in the whole of the Czech Republic after the capital of Prague, Brno is the proud capital of the Moravia region. 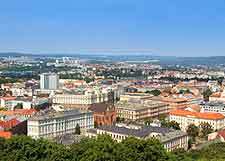 Brno is a city with a definite cosmopolitan flavour and its lengthy and rather grand boulevards at times offer a distinctive Parisian atmosphere. Locals in Brno like nothing more than to enjoy a coffee and a spot of culture, and the countless cafes are usually quite energetic. Rarely overflowing with tourists, Brno is a good place to experience traditional Czech life and some tasty regional specialities, rather than tourism themed attractions. The Tourist Information Centre (Kulturni a Informacni - KIC) is to be found on the Radnická, within the Old Town Hall. Brno train station also contains an additional Tourist Information Centre, while travel agencies are located along the Nádrazni and the Vachova. With seasonal summer fireworks (Ignis Brunensis), regular trade fairs at the Brno Exhibition Centre (BVV) and even Grand Prix motor racing, tourists will find plenty to keep them fully occupied here. Few landmarks in the Czech Republic come more impressive than the brooding fortress that is Spilberk Castle, and the gigantic 14th-century Cathedral of St. Peter and Paul. For the very best views of Brno and Denisovy Sady Park, you can even climb the tower of the cathedral. 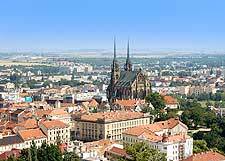 More information about Brno Tourist Attractions and Landmarks. Museums are commonplace in Brno and cover many topics, with information about the Moravia region, the Romany gypsy culture, genetics, technology and even medieval prison life within Spilberk Castle. There is also much in the way of art galleries, with the Moravian Gallery comprising no less than three branches - at the Mistodrzitelsky Palace, Prazakuv Palace and also at the Applied Arts Museum. 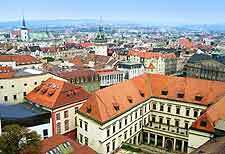 More information about Brno Museums and Art Galleries. Prague lies just over 200 km / 124 miles to the north-west of Brno and for many is close enough for a day trip, if you are happy to just experience a glimpse of what it has to offer. Tourists exploring Moravia should consider visiting the neighbouring cities of Olomouc, Prostejov and Ostrava, where you will find countless beautiful churches, monuments and ancient fortresses. If you are visiting Brno in July, don't overlook the Folk Music Festival in the nearby town of Telc. More information about Brno Attractions Nearby.